Jack's mom is gone, leaving him all alone on a campsite in Maine. Can he find his way back to Boston before the authorities realize what happened? Ever since Jack can remember, his mom has been unpredictable, sometimes loving and fun, other times caught in a whirlwind of energy and "spinning" wildly until it's over. But Jack never thought his mom would take off during the night and leave him at a campground in Acadia National Park, with no way to reach her and barely enough money for food. Any other kid would report his mom gone, but Jack knows by now that he needs to figure things out for himself - starting with how to get from the backwoods of Maine to his home in Boston before DSS catches on. With nothing but a small toy elephant to keep him company, Jack begins the long journey south, a journey that will test his wits and his loyalties - and his trust that he may be part of a larger herd after all. Start reading Small as an Elephant on your Kindle in under a minute. 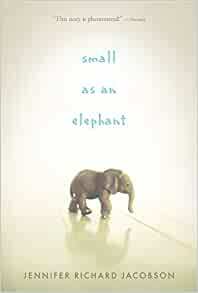 Jennifer Richard Jacobson's nuanced and heart-wrenching middle-grade novel, Small as an Elephant, gives a quiet force to one resilient boy and his mentally ill mother. A classic journey story, this is a very believable and exciting adventure with modern accoutrements. A near-perfect mix of poignancy, humor, and masterful writing make for an unforgettable journey. I loved Jack, and the adventure he went on. All the cool elephant facts were interesting too. The story around mental health is an important one. 5.0 out of 5 starsA most amazingingly wonderful book !!!!! I bought this to read and review and I am so glad I did. I cannot recommend this book enough!!!! Not just a children's book so please give it a chance. As I've read some of the reviews of this book on Goodreads, I've pondered on the various comments. Some people loved it, some people didn't. Some thought it was believable and some did not. I guess it just goes to show that few if any books are universally loved. This is the story of Jack, and eleven-year-old from Jamaica Plain, Massachusetts, who finds himself alone at a campground in Maine. His mother suffers from mental illness and has abandoned him. Jack knows that if he tells anyone about this, he will most likely be taken from his mother, and since this has happened before, he decides to try to find her before doing anything else. After discovering that his mother is not accessible, he decides to try to make it home. Once he realizes just how far away home is, he decides to do something that he hopes will let his mom know he forgives her. His struggles to get enough to eat, find a decent place to sleep, keep him from admitting that he and his mother need help. But eventually, Jack receives the help he needs. Some reviewers think the parts about the elephants are not necessary, but I disagree. Jack's love of elephants and the small plastic elephant he carries for most of his journey, help Jack complete his journey. Maybe it's because I have a similar passion for horses that I can understand Jack's passion and his clinging to that passion to avoid thinking about his mother's abandonment and the feelings that go with it. Yes, Jack does sometimes behave both older and younger than his age, but having worked with kids his age as well as younger and older, I can say that while some kids mature faster than others, but they all have moments of contradictory behavior (like many adults, too). In addition, sadly enough there are all to many children in the world who have to learn to take care of themselves far earlier than they should. I found this book an interesting, empathy-inducing read. A very arduous journey for a sweet-natured 11 yr old boy of a mother who is afflicted by bipolar I. Young Jack finds himself abandoned at a campground in Maine after having a heated argument with his mother the previous night. Upon awakening to his unwanted solitude, Jack begins his multi-goal'ed journey of finding his mother, evading authorities, and trekking home. Along the way, he's enriched and sustained by his travels, fears, curiosity, memories, and interests (elephants, for one!) sweet Jack's journey feels, at times, hopeless - for both him and the reader; but, don't worry too much!...all ends well in the end. "Small as a elephant" is about a boy named Jack. His mother leave' s him with only $14 a tent, sleeping bag,change of clothes, and backpack, NO FOOD,NO WATER,nothing . He take a terrorist hike from Maine to Jamaica plain,MA but first he has to make one stop. Lydia an elephant. She's not just an elephant she's the only elephant in Maine. He just has to see. Jack must steal work and lie to get to Lydia and get home. His BFF Nina thinks somethings wrong when he says to her on YOUPAGE when he stops at Bar Harbour (one of the place his mom said they had to go it was on the list). So if you are looking for a page turner and adventurer than this is the right book for you. You may even cry and for the men that think oh am not going to cry YOU MOST LIKELY WILL!! 5.0 out of 5 starsDo not want to put dpwn! Really enjoyed the main character and the descriptive writing that made you picture the places and people of the story. This young adult novel was a good read. It is about a young boy (Jack) who due to some unexpected circumstances has to learn to survive by his good senses and wit. It is a story of relationships, love and the power of forgiveness. This story delves into the complicated relationship between Jack and his mother, something he has always dealt with and also about his fascination with elephants. Each chapter start of with some fact about elephants, which I found very interesting.